The idea of a little game in WordPress came at the WordCamp Switzerland in early 2011. For an interactive session at the WordCamp Germany in Cologne in 2011, one of the creators Thomas, thought that it’d be nice to have a game-session. 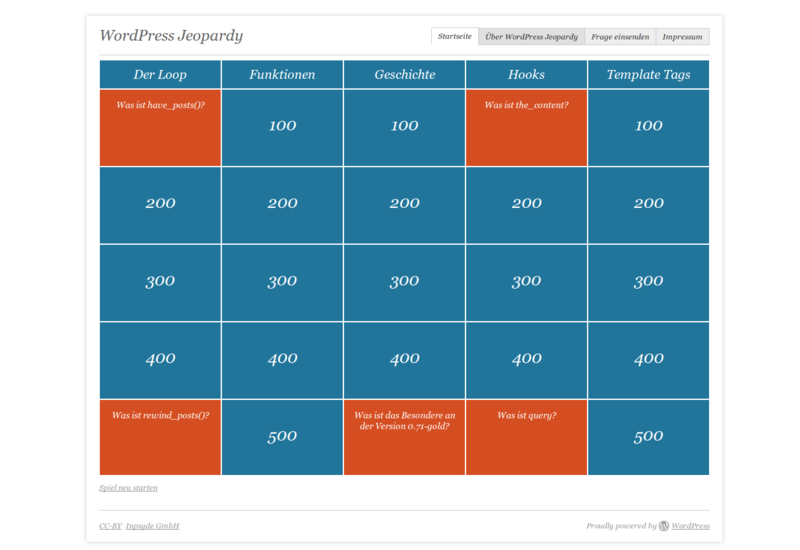 On 24th of September started the first WordPress Jeopardy Game Session. For that, the whole room was divided in two teams to battle each other. The points were counted, but nobody really knows who won. The WPJeopardy was made with WordPress features. Every answer is a post with its postmeta as questions and points. First of all, there’s a german game-pad. In future there will be some more different pads for several skills. Also, there will be a download-area with the theme and the playable pads. The rest of it is simple CSS and jQuery with an onClick event and some positioning stuff. Well, in all, it’s not magic. It’s not even hard to understand how Jeopardy works. Yeah, this is almost identical to http://www.wpgameshow.com/ from WordCamp Detroit.